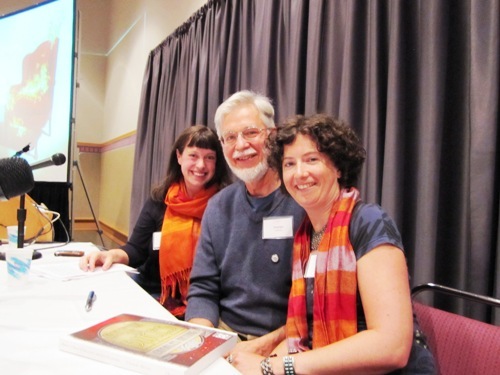 From left to right: Kelly Clarke, Charles Heying and I on a panel about food and craft at last year's 2010 Wordstock. Looking forward to being on a panel this year too -- Saturday's Every Book is a Start-up. This year I'll be speaking on a panel on Saturday at 2pm on the Wordstock Community Stage titled -- Every Book is a Start-up with Jen Stevenson and Kelley Roy moderated by Todd Sattersten. The focus of the panel: "Learn from author-preneurs who found unconventional methods to launching their books about Portland's food scene." This year's sixth annual Wordstock was a blast. There are some Portland events that I do my best to never miss in Portland -- Portland International Film Festival, Portland Fermentation Festival, PDX Adult Soapbox Derby to name a few -- and Wordstock is definitely one. I heard a lot of grumbling about the grey, rainy weekend this Saturday and Sunday but none of it was from Wordstock folks because we were inside all weekend talking, reading, attending readings, learning about, checking out and buying books. A weekend very well spent. Highlights for me included tabling with the Hawthorne Books crew, attending two fantastic panels: The Future of Reading and a Karen Karbo and Kim Dower panel on book promotion, seeing old friends from here, here and then some and making new ones. 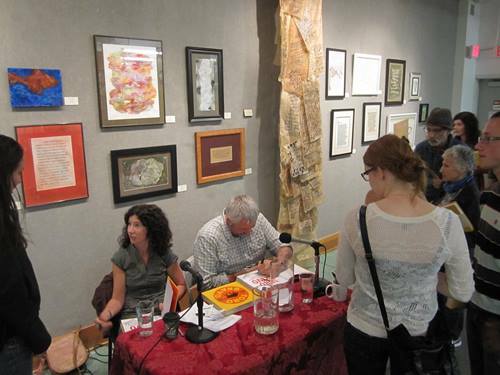 I was also very honored to be invited to speak on a food and craft panel with Charles Heying moderated by Kelly Clarke -- arts and culture editor for Willamette Week on Saturday. I was nervous with the stage, lights, microphones but got over it and really enjoyed talking with Charles and Kelly about Portland's awesome and diverse artisan goods culture. I talked a lot about PDX food and drink of course and Charles talked about that and then some. We traded books and I can't wait to read his. Our seats were not on fire but the microphones didn't work at first. I guess I look very serious when I'm thinking. Hanging with the Hawthorne Books crew -- Kate Sage and Adam O'Connor Rodriguez. Hawthorne Books' Rhonda Hughes after her Wordstock panel.